Karen Blumenthal wrote an interesting article in the Wall Street Journal August 25, 2009 entitled “How I Got Burned by Beanie Babies“. 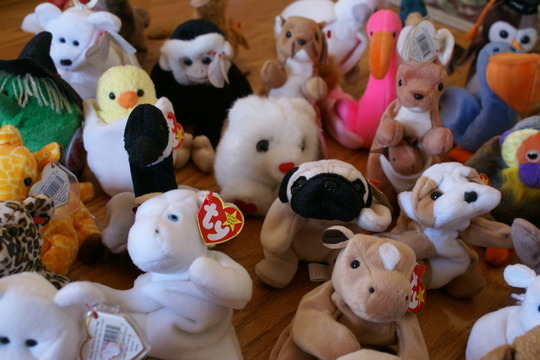 She relates her experience in the Beanie Baby hype to recent bubbles we’ve experienced. The article is not ground-breaking, but it deals with a lesson that never seems to sink in. The article can be summarized with this quote: “In a speculative environment, just about the only ones who profit are short-term traders.” It’s a tough lesson that is too often learned the hard way. There were a lot of people who thought that Beanie Babies would hold their value, enough to cover college for their kids. Turns out that’s only true today if the kids get a full-ride scholarship. Blumenthal relates her experience with Beanie Babies to several bubbles and a little about how the hype builds. A lot of things are like that. One thing that comes to mind for me are sports cards. I remember collecting baseball and hockey cards thinking that someday my collection would be worth a lot of money. Unfortunately, cards don’t hold their value very well, speaking generally. Rookie cards tend to be the prized possession, but those aren’t even a guarantee. In 1991/2 I purchased an Ed Belfour* rookie card for $8.00. Apparently If I’d waited almost 20 years, I could get the card for $1.25** at Check Out My Cards. I can now pay for .5 nano-seconds of my kids college education. Even if I could sell the card for $8.00 today, I’d still technically be losing money because inflation. *** That’s not the only card that hasn’t turned out to be the gold mine I expected (I’ll touch on some of my other sports card investment fantasies in a future post). Granted, there are cards that hold their value and are worth the money, but they are rare and generally are at least 40 years old (They tend to have names like Mantle on them). It all goes back to the quote above that short-term investors are the only ones to make the money. There’s no way to predict when a bubble will burst. Even when an expert nails it, it’s still just a guess, educated and informed as it may be and s/he may be wrong the next time around. I’m not saying you need to avoid the bubble entirely, just know that you need to get in and get out quick. My problem was I bought the hockey card at it’s peak. I don’t think the price went up much past $8.00. That’s why you need to know what you’re in for, because you may be left holding the bag (you’re lucky if that’s all you’re holding). That being said there may be instances that holding on may be worth it for the extreme long hual, but you still want to get in low. Once the real hype has already begun, it’s probably too late. You need to be able to hold on longer than the crash. Beanie Babies may be valuable again someday, along with my hockey card, but that may not be for another 100 years. Then there’s always inflation. *At the time Belfour was a standout rookie goaltender for the Chicago Blackhawks. Many thought he would be the Wayne Gretzky of goal-tending. **That’s 50% of the regular price even. The worst is I ended up with the very same card a week or two later in a pack. ***Today I’d have to sell the card for $12.65 to make a profit.